As a kid, shopping for school supplies was one of the best parts of the school year. If going to math class didn’t put a smile on your face, then picking out new pencils, folders, and crayons sure did! How can you revive some of that childhood enthusiasm you had for school shopping? 1: Legos: All Legos can connect with one another. When you have a big pile of Legos in front of you, there truly is no limit to what you can build! Why? Because each and every little, plastic block produced by Lego is completely connectable with all of its counterparts – no matter which year it was made in. Legos are part of a universal system. This means that even if you have a Lego piece from 10 years ago, it will still connect perfectly with any Lego piece that you buy today. So, what’s the oldest Lego piece that you could use? If you’re a vintage collector (or, maybe, just someone holding onto your grandparents’ old toys), you could build a Lego masterpiece with a mix of blocks from today and blocks from 1932, the year in which Lego was founded. 2: Play-Doh: It was originally wallpaper cleaner. Play-Doh was first created in the 1930s by Noah McVicker – but it was no child’s toy. Instead, this gummy substance was used to clean wallpaper. In the early 18th century, home heating systems relied mainly on coal. Unfortunately, the coal left a dirty residue on homes’ walls. McVicker, a soap manufacturer at the time, invented a cleaning putty to rub away this soot. After World War II, however, when natural gas heating became more popular, the need for this cleaning putty dissipated. That is, until Joe McVicker (Noah McVicker’s nephew) noticed that his sister-in-law was using the putty to make crafts in her nursery school classroom. The younger McVicker immediately seized the opportunity to turn the old cleaning product into a toy. By 1955, the putty was available on stores’ shelves in three new colors (red, blue, yellow, and the original off-white) under its new name: Play-Doh. 3: Eraser: The first eraser was bread. Pencils have been in use for hundreds of years, but the eraser was only discovered in the 18th century. So, what was everyone doing to erase their mistakes before then? Using bread. That’s right, the first eraser was nothing more than a balled-up piece of moist bread. Evidently, this material worked just fine to erase graphite markings. But there was one problem: bread gets stale. So, who would go on to invent a real eraser to replace bread? English engineer, Edward Narine – but it was more of an accident than a true invention. One day in 1770, Narine accidentally picked up a piece of rubber instead of bread, only to discover that this material proved even more effective at rubbing out unwanted pencil marks. In succeeding years, scientists would perfect the formula for the perfect, gummy eraser we all know today, leaving bread where it belongs (in the kitchen) instead of among our educational supplies. 4: Glue stick: It was inspired by lipstick. You may be surprised to know that the glue stick is a relatively new invention. (New, in that, it has been around for just barely 50 years.) So, when did man dream up the glue stick? It was in 1969. A German chemist, Wolfgang Dierichs, was onboard a plane and noticed a woman touching up her lipstick. It was the lipstick that inspired him. Dierichs noted that the means of delivering product through a stick was quick and convenient and, most importantly, not messy (a primary concern when dealing with a sticky substance like glue). The German company to first put the glue stick on the market was called Henkel, and they named their product the Pritt Stick. The Pritt Stick immediately achieved enormous success; by 1971 it had broken out of the German market and was sold in 38 different countries. 5: Playgrounds: The first playground was built in 1859. Whoever said that play time is not an important part of the school day has not been paying attention in history class. Playgrounds have, in fact, been touted as a legitimate means of educational instruction since the 19th century. It was at this time that psychologists began to reason that, on the playground, children can learn to cooperate with others, to play fairly, and to practice good manners. During this period, the first public playground was built in Manchester, England in 1859. However, playgrounds did not gain significant popularity until the 20th century when automobiles started crowding the streets, forcing kids to find a new, safe place to play. This gave birth to the “playground movement,” a reformist idea that even the simplest jungle gyms aid educational development and reduce child delinquency. 6: Pencils: They have been yellow since the 1800s. When you think of a pencil, a bright, yellow #2 Ticonderoga is usually what comes to mind. But have you ever wondered why pencils are traditionally yellow? The answer dates back to the 19th century. In 1890, a company in Austria-Hungary, the L. & C. Hardtmuth Company, debuted a new line of pencils (which they called the Koh-I-Noor brand). They claimed that these pencils were the best and most expensive around, and they wanted to showcase their quality. At the time, most other pencils were either painted in dark colors, or not at all. To stand out from their competitors, the L. & C. Hardtmuth Company decided to paint their special pencils a distinct yellow. Eventually, other companies mimicked the bright tone in their own pencils in hopes of being associated with the high quality brand. Today, while you can buy a pencil in nearly every color of the rainbow, the traditional style is still that classic, bright yellow. Even though you’re not a kid anymore, shopping for educational supplies can still be fun! 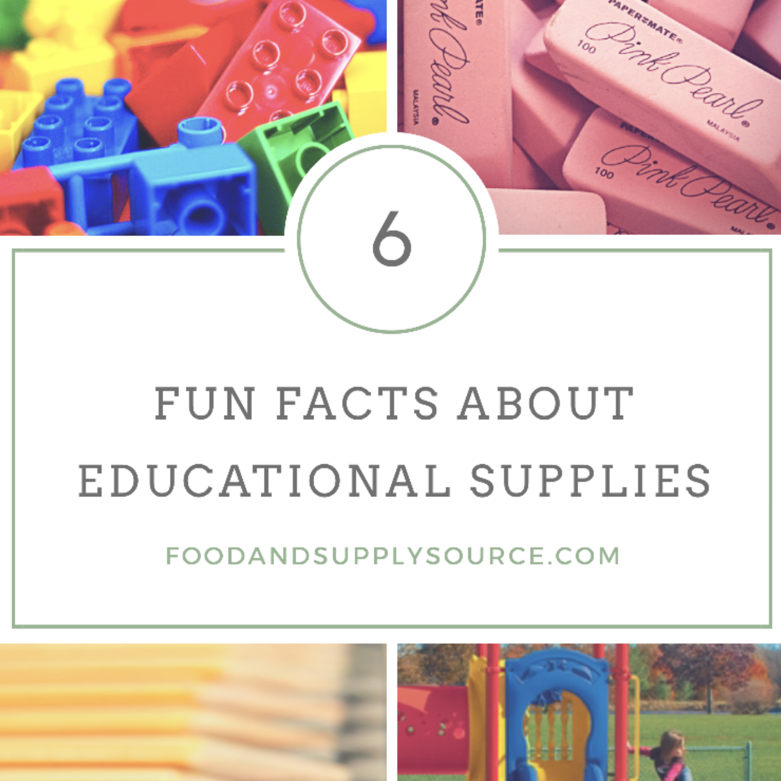 Even better, shopping for educational supplies can be easier and less expensive when you work with a Food and Supply Source vendor. To get set up with our Education Supply Vendors and SAVE 15% SITE-WIDE all you need to do is email info@foodandsupplysource.com with your Name, Organization and Email Address. We’ll get you set up in no time!